A wide range of amino acids and their derivatives act as neurotransmitters (Table 4.3). 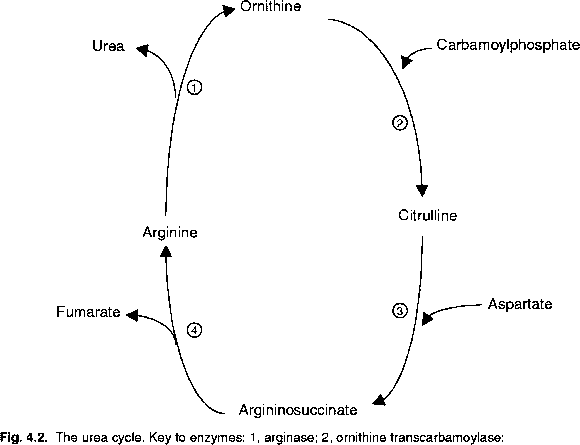 Amino acids directly involved in this function are classified within the amino acidergic system, whereas those derived from the aromatic amino acids and tryptophan are categorized within the monoaminergic system (Bradford, 1986). The synthesis of GABA from glutamate has already been shown [Reaction 4.9], The formation of dopamine and noradrenaline from tyrosine and of serotonin from tryptophan respectively are depicted in Figs 4.10 and 4.11. Table 4.3. Amino acids and their derivatives as neurotransmitters: definitive and proposed compounds.